This extra large punched tin star lamp is a perfect addition to bring warmth to your rustic interior or exterior decor. 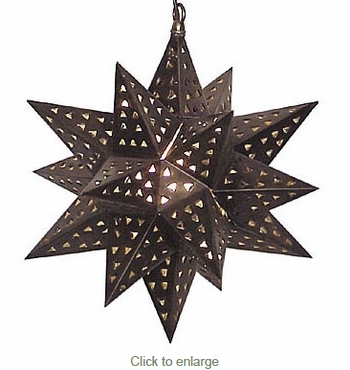 Our aged tin star lights, also called Moravian starlights are handcrafted and punched by artisans in Mexico. These rustic tin decorative light fixtures complement any southwest, Mexican or rustic theme.